Thank you to the 2,300 who responded to the survey. That's better than 8% of the campus community, and better than our dream target of 2,000. June 21: Two lots of winners of the prize drawing have been selected, and will be notified shortly. Data analysis in under way, and the project report should be complete by December 31. Please return to this URL for the results, and periodic updates. Thanks for dropping by! Click the buttons above to participate in the travel survey on-line. Or download the hardcopy edition (English, Español) and drop it in campus mail. or one of several gift certificates to the UCSB Bookstore and Jamba Juice. We estimate that the probability of winning a prize in the drawing is approximately 1%. We'll have to ask for your name and phone number — they will be used only for the drawing, not associated with the response. You may leave them blank and not enter the drawing. If you're taking the survey by hardcopy, please write your name and contact information on the form to register for the prizes. The purpose of our study is to analyze and promote transit. 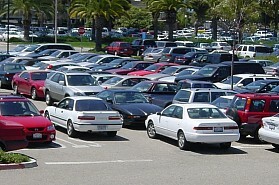 Another urgent purpose is to address the parking crisis at UCSB. One reason for low transit use in American cities is the dispersion of residential centers. It is uneconomical for transit operators to service far flung neighborhoods, compared with compact, high-rise apartments in say Hong Kong. However, large employment centers such as universities do represent a rare concentration of demand on our landscapes, and we argue that these should be the principal users of transit. 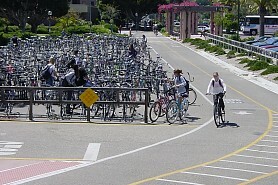 At UCSB, more than 80% of faculty and 75% of staff drive to work. As the campus grows, parking demand is rising, and with new buildings being constructed, supply of parking space has now fallen below demand. If nothing changes, the situation will get much worse in the future. It costs about $25,000 to provide each spot in a multi-story garage, and if this is UCSB's only way out, parking charges will have to increase considerably to recover these costs. Valet assisted "stack parking," originally introduced as a temporary measure, could become a permanent feature of the UCSB campus. Clearly there is an urgent need to migrate UCSB's single occupancy vehicle (SOV) drivers to carpooling, transit, biking and walking. Do bus services cover the city well enough that we can realistically expect such a migration, or do new services need to be introduced, better tuned to certain areas of the city and certain times of day? What are the economics of that? How about licensing the use of off-campus lots like churches and shopping malls, with a shuttle service to campus? Could telecommuting reduce the numbers coming to campus? How about parking permits that work only say on Tuesdays and Thursdays? How much complexity and flexibility is there in commuting schedules, and is it realistic to expect habits to change? the design of an express route catering to areas that are currently not well served, and where bus use is most likely, based on the models. We invite all travelers to UCSB to take the travel survey. Most respondents will answer about 25 questions, taking 10 minutes or less. No personal information is sought except your home address (which is obviously an integral part of a commuting study), but you may mask it by rounding it to the nearest 100. You could leave your address off entirely, though that would reduce the usefulness of your response. But please do not enter a fictitious address — that will really mess up the findings. We will gather the IP address of your computer, so that we can audit the data in the event of multiple submissions (inadvertent or deliberate) of the form (an IP address looks like "128.111.255.255" for example; while it is technically possible to link this to a person's address, it would usually require information from your Internet Service Provider to do so, and ISPs do not normally divulge this). Once the data are checked, the IP address on each record will be discarded. We would like to track a few travelers using GPS, to document travel time and route to campus. No personal information is attached to the data, but obviously we'll need to communicate with you and equip your car/bike, so we'll need some personal details. Click the "Sign up for GPS tracking" button below. UCSB Transportation and Parking Services (TPS) support and facilitate the study, and will be apprised of its findings and recommendations; however the investigators in the study are not directly responsible for formulating or enforcing UCSB transportation policy. Some questions hypothesize dramatic hikes in parking rates, and off-campus parking arrangements. Our intention in asking these scenario questions is to gauge how respondents weigh time versus cost, and we use this to develop utility estimates and to design services that meet those needs. Bus riders are similarly asked how they trade off fewer transfers versus longer routes. Thanks again. We appreciate your assistance with our study, and in decongesting UCSB.